Dr. Alidadi will make sure that you fully understand the procedure. If you haven’t seen a dentist for years and have various broken, worn or missing teeth, full-mouth reconstruction might be necessary to return your smile to full beauty and health. Dr. Feryal Alidadi has the technology and expertise to comfortably recreate your smile. With full-mouth reconstruction, all of a patient’s teeth are either restored to health or replaced. This not only creates a beautiful, healthy smile, it also enhances overall facial appearance. A straight and healthy smile is, in itself, rejuvenating, and when the bite is improved and a full set of teeth are present to support the lower face, it can also act as a facelift. Dr. Alidadi will use the right combination of procedures to reconstruct your smile successfully. Dr. Alidadi is trained and experienced in reconstructive dentistry. She knows the right combination of procedures to successfully reconstruct your smile back to its proper form, function and aesthetics, while ensuring that your bite is not altered or damaged. She knows how to do it all in the most affordable, expedient and minimally invasive manner. Dr. Alidadi has completed ongoing continuing education classes dealing with full-mouth reconstruction techniques at some of the top dental learning institutions in the country, including Spear Education. Implants and a bridge can be used to replace several missing teeth. 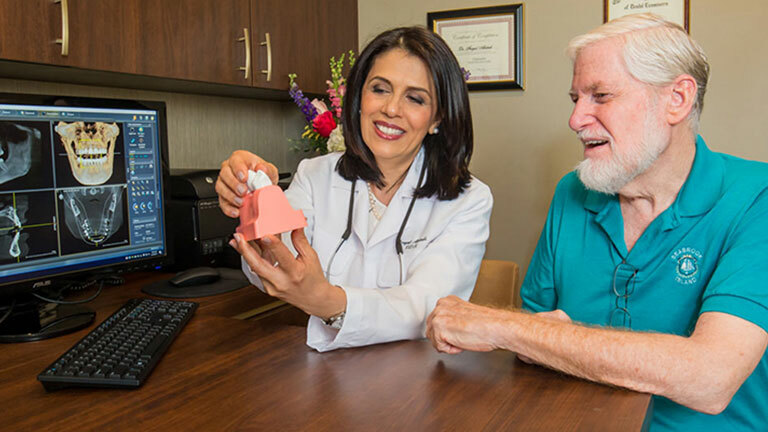 Dr. Alidadi uses a variety of procedures to recreate a great smile and repair any tooth or gum damage you might have developed due to poor dental health. She uses a top-quality local lab to make sure that all ceramic work is of a high standard. A full-mouth reconstruction generally includes a combination of dental implants, crowns, dental bridges and sometimes implant-supported dentures. 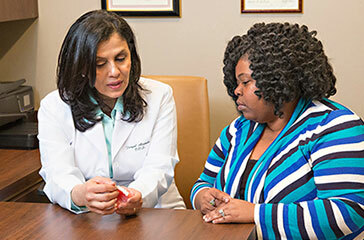 Whatever procedures Dr. Alidadi believes are right for your situation, you can count on her to use a minimally invasive approach. And you won’t get an implant, bridge, denture, etc. unless you truly need it. For example, if you’re missing four teeth, rather than give you four implants, Dr. Alidadi can use only two implants with a bridge. When you need a lot of dental work, it can be a bit intimidating. Dr. Alidadi understands this and knows how to make you comfortable. Her injections are very gentle and virtually unnoticeable. She’ll continuously check with you and immediately take care of even the slightest discomfort. 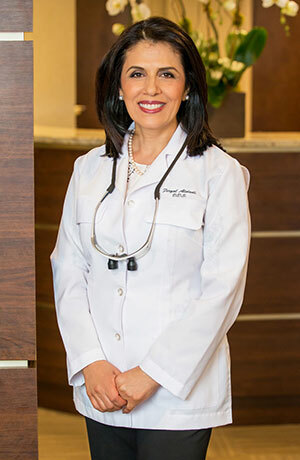 You’ll also find Dr. Alidadi and her dental assistants to be kind and reassuring.